When I was diagnosed with cancer, my children were 12 and 22, respectively. I know, I know, what can I say? My oldest put me through a 48 hour labor, it took me a while to want to try again. Anyway, at the time of my diagnosis, my oldest was out of the house and on his own (yes, young moms, they do leave and yes, it's hard - dealing with that could be a blog on its own, and honey, if you are reading this, you can come back any time). My youngest was in middle school and at that point, they are very peer-centered. Telling them I had cancer was easy. Both were old enough to understand, and not only that, both knew enough so that the world "cancer" didn't automatically bring up the idea of death. I told them I'd have to do chemo, asked my oldest for help with his brother (picking him up after school) and told my youngest I'd be tired and bald but would live through it. They both took it in stride and did a great job of making life easy on me, as of course, did my husband. My oldest did pick up his brother every day during the times when I couldn't drive or had a doctor's appointment - my youngest son continued to get straight As in a rigorous International Baccalaureate program and participated in many after-school competitions and events - my illness didn't phase him, as I had intended. Sometimes, I'm not sure he even noticed. Which made me happy, by the way. I did not want to burden them with my illness and I made it very clear that this was a small bump in the road and nothing to worry about. I believe that kids, even older ones, take the lead from the parents reaction. Staying calm was key. 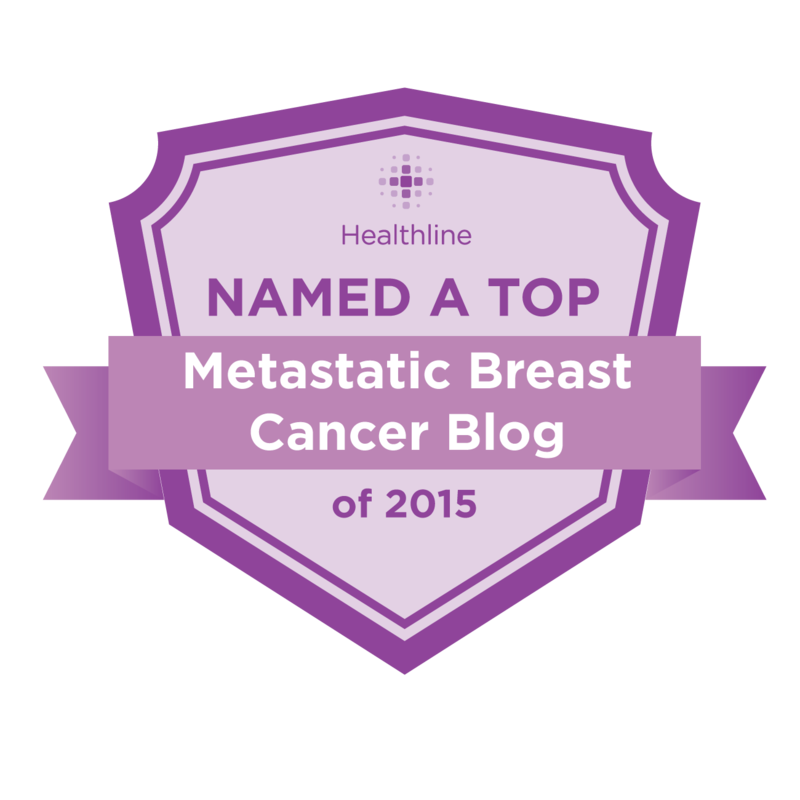 I always believed I'd be a "survivor" (gag) and lived that way through treatment. In being a part of the cancer community, I of course have met mothers of children much younger than mine. I have always felt bad for them - it's one thing to tell a very bright, independent 12 year old that mom has cancer and quite another to tell a needy 3 or 5 year old. In all cases though, it's necessary to model a good outlook for the children's sake, and I wondered how the parents of younger children manage? I came across a book for parents of young children, and thought it was a great idea. I asked for a copy and the author, Sue Glader, generously sent me one. 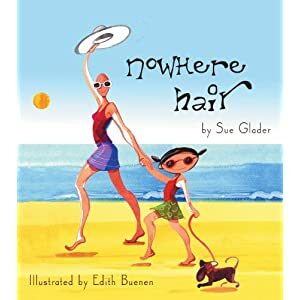 The book is called "Nowhere Hair" and is about a little girl searching for her mother's hair. She then asks outright where it went. Mom explains she lost it because of medicine for cancer but is reassured that she is still loved - which is really what every child wants to know. This book is fantastic for explaining cancer in a way that a young child can understand and relate to, and also shows the reality (baldness, tiredness) along with the truth, love and acceptance. The illustrations are charming, the story is captivating and, I believe, it is the perfect book to explain what is about to happen to a younger child. Grandmothers will also be able to use this to explain to their grandchildren why they are sick. This book fullfills a need that, to my knowledge, has been unmet in Cancer World so I'm hoping that Sue will do well. Hospitals and oncologist's offices should buy this book and keep copies in their waiting rooms. Nowhere Hair can be purchased at Amazon, or you can win a copy from me! Leave a comment detailing your fears about telling your children, or your experience doing so, and I will choose one by Friday, February 25th. Hi - We have 4 children in our household, the youngest is 5 years old and the rest are 8, 9 and 11. While the older ones understand what is happening (and I just underwent my mastectomy 2 weeks ago, and am now waiting to start chemo) the youngest, Ava, asks me every day "are you better now?" and she just doesn't get that it will be a looong journey. Her show and tell last week at kindergarten? "My mommy got really sick and lost her boobies. But she's all better now." Good thing the teacher knew about the cancer first, but I don't know how many of the kindergarteners went home and asked their moms about loosing their boobies ... hehehe. oh boy is this a subject close to my heart. i couldn't create a "don't worry" fiction for my kids because (1) i was stage 3 and had a 10% 5 year survival rate, and (2) their uncle had died less than two years earlier of cancer at 36.
my children were 2, 6, and 9 at the time of my diagnosis. i have since found some good books on the subject, but i am always eager for more! We all want to keep things as "normal" as possible through our treatment, but as the previous poster stated-they figure out so much on their own. My husband and I adopted our daughter from China 2 years ago, and she has adapted so well! I fear that watching my go through chemo will mess her up somehow. This book will be a nice way of explaining to a 5 year old some of the changes I will be going through. Thanks for making me aware of it!